The Bank of England’s Monetary Policy Committee has voted unanimously to hike interest rates from 0.5% to 0.75%, taking the Base Rate above 0.5% for the first time since March 2009. In this post I have answered some common questions about this change. Many mortgages and new retirement annuities will be affected by this change. If you have any questions about how this could impact your personal finances, one of our advisers will be happy to field any questions you might have. Please call 01642 477758 or visit our Contact page to arrange a free initial meeting. Anyone with a mortgage linked to the Bank of England Base rate (either through a tracker, Standard Variable Rate (SVR) or discounted SVR mortgage) should see an increase in their monthly payment. This could happen immediately or it could take time for your lender to apply the increase. For anyone with a repayment mortgage (where some of the loan is paid back each month) it is difficult to predict exactly how much the payment will change because this will depend on how much you borrowed, your current mortgage rate and the length of time remaining on the mortgage. For interest only mortgages (where the loan is not paid back until the end of the mortgage) it is easier to predict how much the payment will change because it just depends on the amount borrowed and the current interest rate. Anyone with debt which is not on a fixed rate will also see their payments rise, but how much the increase will be and how soon it will be applied depends entirely on the terms and conditions of the loan. For savers, it is likely there will be a bit of a mixed bag when it comes to increasing savings interest rates. Some providers will increase their rates by 0.25% but others might pass on less of the rate rise. Other, more generous, providers might even hike their savings rates by more than 0.25% in order to attract more business. Overall it is good news, although there will be some big winners and some big losers. The main reason the Bank of England have decided to hike rates now is because they feel the economy can afford it. This is because wages are rising at a healthy pace, economic growth is acceptable and inflation is too high. 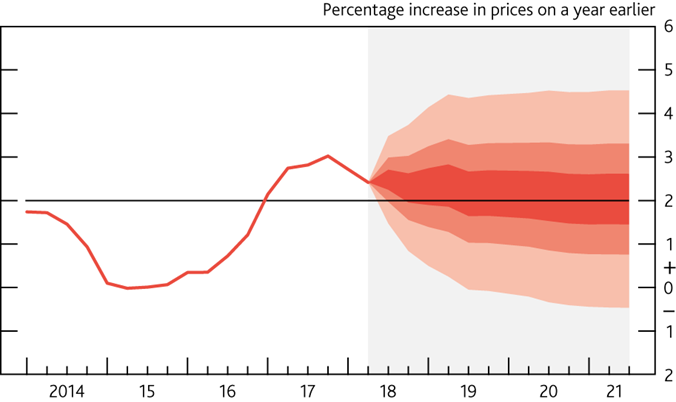 The Bank of England hopes this 0.25% rise will cool inflation (ideally to around the target rate of 2% instead of the current rate of 2.4%) and wage rises, while simultaneously not having a marked impact on economic growth. The Bank of England acknowledged that borrowers will feel the pinch with higher interest rates. However, they pointed out that inflation (i.e. the rising cost of living) tends to impact those who are less well off far more than it affects the wealthy. By hiking rates the Bank hopes to reduce the rising cost of living, meaning that while debt repayments will cost more other things will not rise as much each year. The Bank also pointed out that it has to make decisions on behalf of the whole economy, not just borrowers, and currently a rate rise is overall the best option for the country as a whole. The Bank of England held off on rate rises at previous meetings, partly due to worries about how Brexit might affect the economy. Given the lack of progress with negotiations, some analysts thought the Bank might hold off on a rate rise in order to give a confidence boost to the economy. Of course, just because rates have risen by 0.25% it does not mean they will stay there; if the Bank worries that Brexit will have a marked impact on the economy in the coming months it has the option to cut rates back of 0.5%. We recommend reviewing your mortgage and other debts to see if the rate rise will be passed on to you. If you are worried about future rate rises it might be a good idea to consider taking out a fixed rate mortgage (although this will cost more than a variable rate mortgage and you might face a penalty if you try to change your deal too early). If you have any questions about your mortgage you should seek advice. Anyone getting close to retirement or in drawdown should also consider whether it is worthwhile buying an annuity with their pension savings. Annuity rates are strongly linked to interest rates and this 0.25% hike could have a beneficial impact on retirement incomes. One of our advisers will be happy to field any questions you might have and you can book a free initial meeting to discuss your options in detail. Please call 01642 477758 or visit our Contact page to arrange a free initial meeting.